Plenty of hotels are home to stunning, world-class art collections, but the new Beaumont London is the one of the only places in the world where you can actually sleep inside a modern masterpiece. Plenty of hotels are home to stunning, world-class art collections, but the new Beaumont in London is the one of the only places in the world where you can actually sleep inside a modern masterpiece. 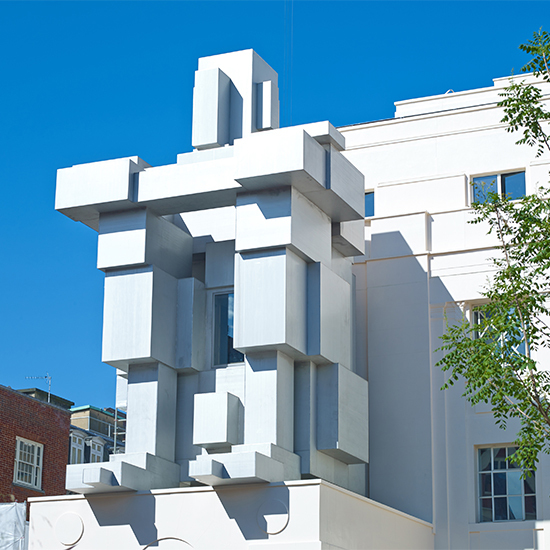 The majority of the hotel’s 73 rooms are housed in a gorgeously renovated 1920’s Art Deco building, with one exception: an ultraluxe suite located inside of a massive architectural sculpture designed by noted artist Antony Gormley. Titled ROOM, the steel piece has an almost Transformers-like appearance from the outside, but the inside is a small cocoon furnished with a lone bed draped in white linens. A skylight provides the only exterior light source; when closed, the room can provide quiet, utter darkness. The interior is lined with oak sections that fit together like puzzle pieces, providing ledges for seating.